Mahmoud Abbas revealed to Russian President Vladimir Putin, “We state that from now on we refuse to cooperate in any form with the U.S. in its status of a mediator, as we stand against its actions.” This was a bit of an introduction to their real stance, which is actually no different than it has been since Yasser Arafat or Grand Mufti of Jerusalem Mohammed Amin al-Husseini (Arabic: محمد أمين الحسين); they want it all with no Jewish State, only an Arab Muslim state where the Jews accept Islamic superiority. In a recent speech commemorating fourteen years of the death of Yasser Arafat, his mentor, stated, “The ‘Deal of the Century’ will not pass and the fate of the land of Palestine will be decided by the Palestinian people.” These remarks were quoted by Channel 10 News which went further claiming, “We are remaining on our land and we will continue to act. Our flag will continue to be raised on the walls of Jerusalem as you always wanted,” referencing to Arafat. “The stage that the Palestinian people are going through is one of the most dangerous that has passed so far – the provocation that began with the Balfour Declaration has not yet ended. The occupation must end. You will not find one Palestinian who is willing to renounce the rights of the Palestinian people.” Abbas has also threatened to cut off all relations with Israel if an agreement is made between Israel and Hamas without his approval. He has already stated that there can be no agreement with which he would agree. Mahmoud Abbas has simply taken the position that he opposes any and every peace between Israel and anybody as he claims that all of the lands belong to the Palestinian Authority (PA) and thus Israel does not exist in his view of the world. We have been listening to Abbas far too long while he has often made the claim that the PA only demands what is theirs, the 22% of the Mandate. Whenever he has made this claim, the Media misrepresented his demand by claiming that the 22% is simply the areas of Gaza, Samaria and Judea, the region of the Shomron beyond the Green Line, as they described his demands for the pre Six Day War lines which are the 1949 Armistice Lines between Jordan and Israel. This is actually inaccurate as these regions while close to 22%, are not the 22% that Abbas demands. What has to be noted is that he claims 22% of the Mandate. When one goes back to the British Mandate and checks the divide between the Arab State and the Jewish State along the Jordan River, delegated 78% of the British Mandate was reserved for Jordan, the Arab State, leaving 22% of the Mandate for the Jewish State, Israel. 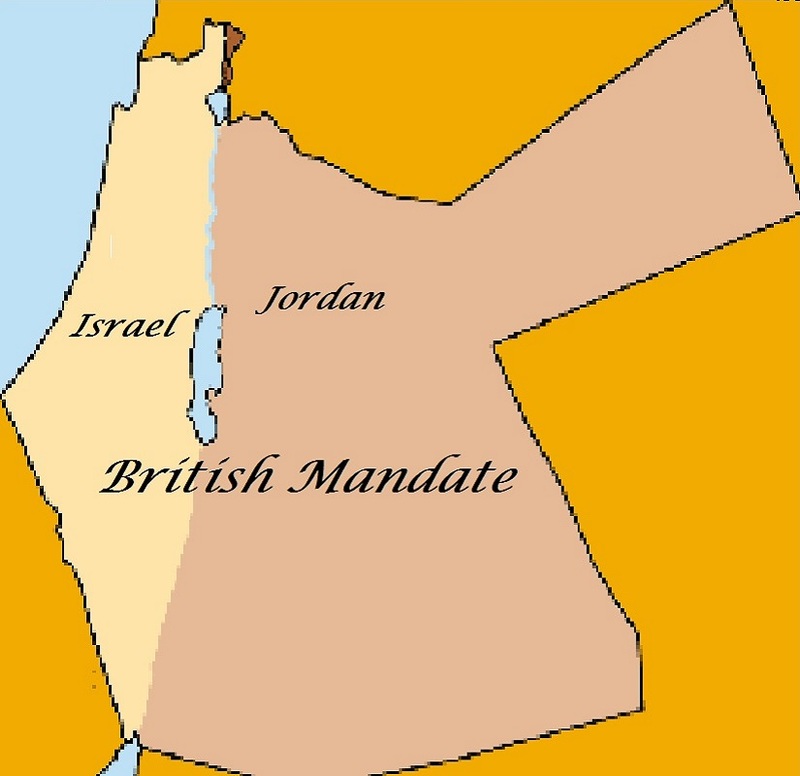 This is Abbas’s claimed 22% as the word Mandate is referencing the divide between Jordan and Israel in the lands promised by the British when they reached the agreement with the Zionist Congress (see map below). Abbas simply wants the 22% of the Mandate which is Israel. Until the truth of the claims by Mahmoud Abbas and other Arab leaders, who will claim the same demands, the replacement of Israel with an Arab Muslim State with the Jews cared for as Dhimmi initially and eventually the Jews will meet the same end as did the Jews of Medina, the Banu Qurayza. Meanwhile, President Trump has been giving signals that his ‘Deal of the Century’ will soon be made public and that neither side will be happy with everything but they will each also like parts and all will see immediately the reasons for the compromises in the deal. All this attention begs a question, why is Israel so important that the whole world appears to revolve around Jerusalem? There is a reason why everything around Israel is so important, but one has to look deeply into the history and the positions and why reaching an agreement will signal a seismic shift in the Arab and Islamic view of the world and not merely Israel. We hope that the rest of the world realizes that Israel is not going to surrender and just hope and pray that the Arabs will treat them humanely. So, if an agreement is ever reached, it will signal an acceptance of the Jews to live in peace and security in their ancient homelands, or at least most of their ancient homeland. Such an agreement will signal that Islam in general and Arabs in particular have compromised on their claim that all lands which have ever come under Islamic control, and specifically Arab control, must always remain under Islamic (Arab) rule and must never be permitted to be ruled by any other. What makes Israel even more important in signaling such a change is because the Arabs and many Muslims have a particularly deeper hatred of Jews than any other group of unbelievers. One could logically reach the conclusion that it would be more readily possible that the Christian, Buddhist, Hindu and other religious groups, including secular humanists, could reach an accord of mutual respect than it will ever be for Israel to reach such an acceptance. We would have to, quite reluctantly and unfortunately, agree that this is very likely quite valid. This is why Israel makes the perfect test case. Let us look at the positions of the various groups. The PA claims they simply desire what is theirs, everything. They claim that they will treat the Jews honestly, which is something we fear with good reason. We know that as Dhimmi there will be demanded that we pay a Jiyza, a tax on the unbelievers in return for which they remain protected. There is no upper limit to the Jiyza which means that at some point the demand could be all of one’s possessions. After that, the Jews would no longer be capable of paying any future Jiyza demand which would remove the obligation to protect the Jews and we all know what follows losing protection. This is the point where the demand becomes convert or die. Still, we would live longer under the PA than we would Hamas. Hamas does not mince words, they simply want to kill every Jew on the planet, and off the planet if we should head out into space. 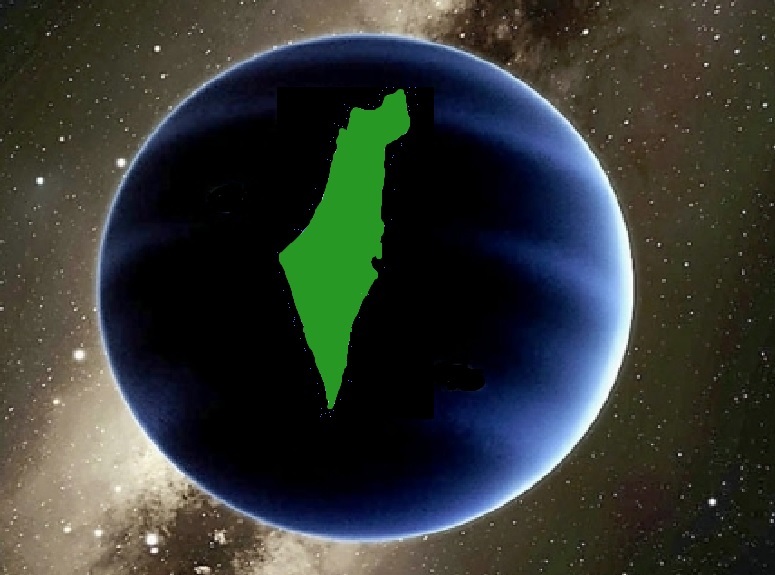 We could find a place where it is obvious from space that we would belong, call it the mythical Planet Israel (depicted below). Of course there is no such myth just as it is highly unlikely that such a planet exists, though most physicists claim that if you can think it, then it probably exists somewhere out in the deepest recesses of space. But the Hatred which the leaders of Hamas express is presumably held throughout much of the Islamic world. So, let us move on to Iran which, while Islamic, is not purely Arab as it is the former state of Persia. The empire which was built by Cyrus the Great who liberated the Jewish People from their exile in Babylon and allowed them to return to their homeland and instructed them to rebuild the Temple in Jerusalem. That is not the view of the current rulers in Persepolis, oh, sorry, Tehran, as they wish to wipe Israel off the map, or at least this was the wish of their past President, Ahmadinejad. The former Prime Minister of Malaysia, Muhammad Mahathir, is another Islamic leader who has expressed desires to be rid of Israel. The general level of animosity against Israel, and also by many against the United States, was in full evidence when President Trump announced the United States intention to move their embassy to Jerusalem recognizing that Jerusalem was, is and always will be the Capital City of Israel and much of the Islamic world broke out in riots, some staged but most were an actual result of the anger of Muslims worldwide. That was a further proof of the reason that no Arab or Muslim nation is supposed to recognize Israel. It was all placed in the Khartoum Convention and the Three No’s, “No peace with Israel, no recognition of Israel, no negotiations with Israel.” That was the decision of the Arab League after their meeting in September of 1967, and was their official position after their loss in the Six Day War with Israel gaining territory which included the Sinai Peninsula, which was returned to Egypt, who released their claim to Gaza, when their peace was reached with Israel. For making this peace, Egypt was evicted from the Arab League for quite a period and Egyptian President Anwar Sadat was assassinated by members of his own military while watching a pass in review of some troops. Later, Jordan also reached peace with Israel releasing their claims to all lands beyond the Jordan River, though they later reneged on that claiming they meant that they gifted those lands to Yasser Arafat and the PLO, a terrorist organization. In many ways, Abbas took down the couching of their demands and came out stating that the Palestinian Arabs will remain steadfast in claiming the entirety of the Mandate Lands. He has also stated that should Israel reach an accord ending the Gaza violence and rioting along the border that he will break off all negotiations with Israel. Well, that is just wonderful, except one need ask, what negotiations is he speaking of which he will break off? 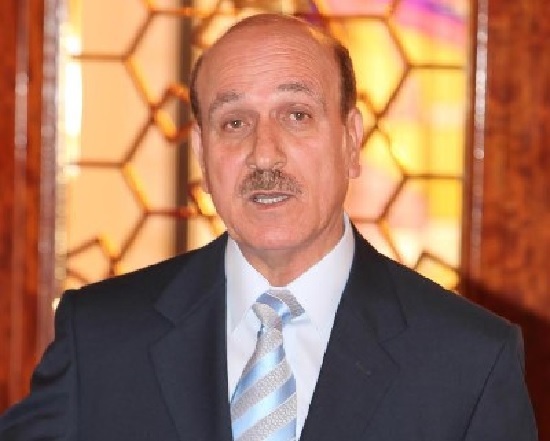 There are no negotiations between the PA and Israel for him to break off, unless he means his repeated denunciations of President Trump and claiming that the United States is no longer an unbiased arbitrator and will be rejected by the PA. Maybe he means his referencing that he would be glad to accept the United Nations General Assembly or similar international group deciding the solution to the Arab-Israeli Conflict. For Israel, that would be like one-hundred-ten wolves and three sheep with thirty or forty cows with ten bulls running for the high ground all deciding what will be on the menu for dinner, and everyone except the sheep are voting sheep or vacating as fast as possible so as not to be dessert. Abbas has been pushing his desire for the conflict solution to be internationalized as he, and we, know what that would bring, the end of Israel. But the only problem we know will be the result is that nobody will ever notice the complete refusal of Abbas to accept anything short of Israel erased and his being placed as the potentate over the new Arab nation of Palestine. We can understand the world ignoring his demand as we have people in Israel who are unaware of his demands simply through willful blindness. Apparently, willful blindness is a politically based disease which goes along with certain political position of which in Israel the Two-State Solution is by far the largest group representing this malady. It is not that Israel would not have accepted a Two-State Solution as we accepted the offered divide offered by the United Nations in 1947 which the Arab League refused instead opting to destroy Israel at her birthing in May of 1948. The Arab League had a half-dozen Arab armies attacked Israel along with numerous militias and volunteers from numerous other nations and assistance by officers from both sides of World War II as advisors. They failed to crush Israel but they did take Gaza and the Shomron (Jordan’s West Bank annexation which they released in their peace with Israel as noted above). We accepted it again with generous offers in 1999-2000 under the auspices of President Willian Jefferson Clinton and again in 2008 with the help of President George W. Bush, the first refused by Yasser Arafat, the second refused by Mahmoud Abbas (Arafat in a suit). Israel had been residing in peace with her Arab neighbors before Egypt and Syria allied with Jordan invaded Israel starting the Six Day War. An uneasy peace continued until the forces from Egypt and Syria attacked starting the Yom Kippur War. The Arabs decided after these two losing efforts by open warfare, they needed to change the equation. This is when they fully backed the efforts of the PLO terror group. This effort changed the worldview from the Arabs as Goliath and the Jews as David to the Arabs as David and the Jews cast as Goliath. The world had absolutely no problem accepting the new venue which cast the Jews as the oppressors instead of the weaker side in the conflict. This has been the situation but now that Abbas has laid out his hand claiming the demand for Israel to be completely destroyed and replaced by an Arab Islamic state with him as the absolute leader, we could hope that somebody out in the greater world will sit up and take notice, but we will not be holding our breath. Yesterday, we quoted a retired Jordanian Ambassador and former editor of the Jordan Times, Walid Sadi, stating in a recent op-ed article in that very same Jordan Times, “First of all, the unity of the West Bank with the East Bank was officially and constitutionally adopted on 24 of April 1950. No one disputes this fact. The Constitution of the country at the time was the 1952 Constitution, which stipulated in no uncertain terms that no part of the Kingdom shall be ceded, period. This provision makes the 1988 decision to cut off all legal and administrative relations between the two banks stopping short of ceding the West Bank to any side whatsoever. Any other interpretation of the 1988 political decision is absolutely untenable constitutionally.” We basically concluded that Jordan was claiming that despite presumably losing these lands in the Six Day War, they were now reclaiming these lands, as it is impossible for the armies of Allah to ever lose a war, and going to enter into any negotiations under the coming Trump “Deal of the Century” with the positions that the Green Line, the 1949 armistice lines are the current borders between Israel and Jordan. Well, if only that were the end of the story one could be amazed with the bravado and disgusted with the lack of reality. Then again, as we are fond of saying, but wait, there’s more! Former Jordanian Culture Minister Salah Jarrar (pictured above), who serves as Vice President of Amman’s University of Jordan, published an article in Al-Rai on July 4, 2018, which slammed President Trump’s “Deal of the Century” outright and proposed a better idea. MEMRI (Middle East Media Research Institute) has translated the entirety of the article for anyone to read. We would recommend that all please visit the MEMRI translation of this article and take in the full arrogance, ostentation, and pomposity of the author and the stated positions and demands. We will only place a small excerpt to whet your taste and provide an appetite for the remainder. 1) The Israeli occupation of the Palestinian lands between the Mediterranean and the Jordan River will end. 2) All the Jews who came to Israel after the Balfour Declaration of 1917, as well as their children and descendants, will return to the countries from which they came, without taking anything with them. 3) The U.S. and Britain will compensate the Palestinians for all the damage caused by the Zionist occupation to the land and its people. 4) The U.S. and Britain will compensate the Arab states for the damage caused to them by the Zionist aggression against their lands, and for hosting the [Palestinian] refugees throughout the years of occupation. 5) All Israelis who took part in killing Palestinians will be turned over to the Palestinians to be prosecuted and to receive the punishment they deserve. 6) The Palestinian refugees will return to their homes and their property. 7) The leadership of the Zionist occupation will sign a document stating that they have no rights, historical or otherwise, in Palestine. 8) Should the Israeli side, or its American ally, wish to negotiate about any of these clauses, this will be put to referendum among the Palestinian people, and [negotiations will occur] only if all the children of Palestine and the families of all the martyrs agree to this. As stated above, go and read the entirety and please buffer your jaw such that it does not fall to the floor at the insanity being claimed and proposed. We can only pray that President Trump is being advised about the trap being set and the preconditions being stated to be taken as facts as he prepares to walk potentially blithely into the lion’s den, and we suspect he will be less fortunate than Daniel from Biblical times. The Jordanian leadership is being pressed not to merely regain the lands lost from the Six Day War but to demand lands lost by the Ottoman Empire resulting from World War I and claiming them as rightfully belonging to the Jordanians as the successors to Ottoman Rule over the entirety of the British Mandate. 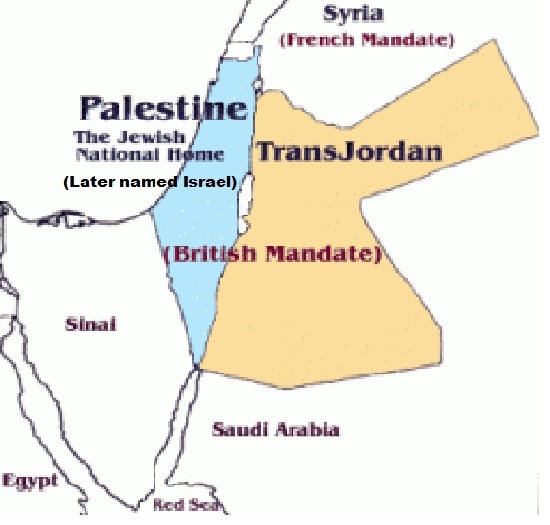 This actually is not half as crazy as it seems because the British would have been content with giving the entirety to Arab rule and proved this when voting in the United Nations to divide is again into Arab and Jewish States after allowing the Arabs 78% of the Mandate lands when creating Jordan. As far as the world can tell, they would have divided Israel in half for as many times as it would have taken to erase Israel using the United Nations and whatever other authority they could find. Fortunately, the Arabs refused that further division and instead attempted to eradicate Israel militarily in 1948-9 and only ended up with Jordan holding the Shomron, which they renamed the West Bank, as its real name was too Jewish, and Egypt holding Gaza. The Six Day War returned these lands to their rightful nation, Israel, as proposed in the original Mandate plans pictured below. The accepted division of the British Mandate which the Arabs and the Zionist Congress agreed upon split the lands with the Jordan River as the demarcation line between the two entities, This should have made everything simple, but when it comes to the world’s relations with the Jews, it is never just that simple as Jewish rights are considered malleable to the point of their complete disregard and destruction. Another takeaway from the diatribe from Salah Jarrar’s compendium of demands is that the United States is but to be the lap dog along with the British in this deconstruction of Israel for which the method and results are plainly laid out and the United States and Britain have their marching orders and demands for them to provide more trillions of dollars and pounds to the Arab treasuries as if they have not done anything up to now. This is what the world is reaping for their complicity in the Arab machinations for the destruction of Israel. The one interesting point in all their plans of mice and men is that they demand that somebody else, the men, do the heavy lifting while they scurry around potentially only managing to get under foot and destroy their plan themselves. They cannot accept that they lost the Six Day War after also almost losing the War to Annihilate Israel which the world and Israel, to her shame, the Israeli War of Independence, as it came immediately after Israel declared themselves a nation believing the Jordan River to be her eastern border. Perhaps what they should do is try to figure out why Allah has allowed every nation to defeat them and what was the point at which this became an identifiable problem. Some historians might point to the point where they abrogated half of the Quran and decided that the Mecca Quran had nothing to teach them. Perhaps when the Islamic faith decided that Jihad was more about conquest than introspection and improving the world through making each person the best person they could conceivably be. It is where many modern Jews have strayed believing they should repair the world and do so by foisting their ideas upon the rest of the world and not looking inside to their souls and finding peace with Hashem and his commandments, all 613 of them. Perhaps both faiths should learn that the real beauty of their faiths is that it advises making oneself better and by having each person improving themselves, the world will take care of itself. Fifty-one years ago on June 8, 1967, the Six-Day War was half way towards its definitive results with every Arab force in full retreat. That includes all of the belligerents. We wish to discuss the realities with timelines, lists, maps, cartoons and our commentary. The build-up to the Six-Day War reaches back almost four weeks where concrete acts were being taken. The upgraded hostility in the propaganda across many Arab states and particularly in Egypt, specifically with speeches given by Gamal Abdel Nasser built up from months earlier. We have a diagram which provides a timeline up through the Israeli Security Cabinet voting to respond to the numerous threats by striking the Egyptian Air Force the ensuing morning. 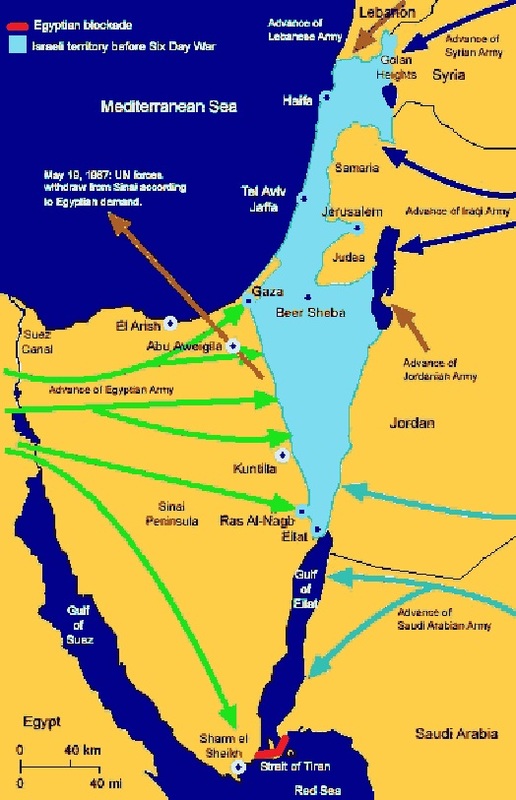 Many people refer to this specific strike as proof that Israel started the Six Day War ignoring the numerous casus belli which included the bellicose threats, massing of troops on two borders (Egypt and Syria), recognizance flights of the Dimona Nuclear Reactor and the closing of the Straights of Tiran to Israeli shipping which had been set as equivalent to a declaration of war in the agreements from the 1956 Suez Canal crisis. Israel had more than sufficient cases for threats all along her borders and had been overflown with military aircraft deep into the center of the nation. The signs that an attack was imminent were multiplying by the day, thus Israel attacked in response to an imminent and overt threat of attack thus having legal cover making her attack to be legal under the 1949 Geneva Convention and its coverage of preemption when attack has become inevitable, obvious and imminent. 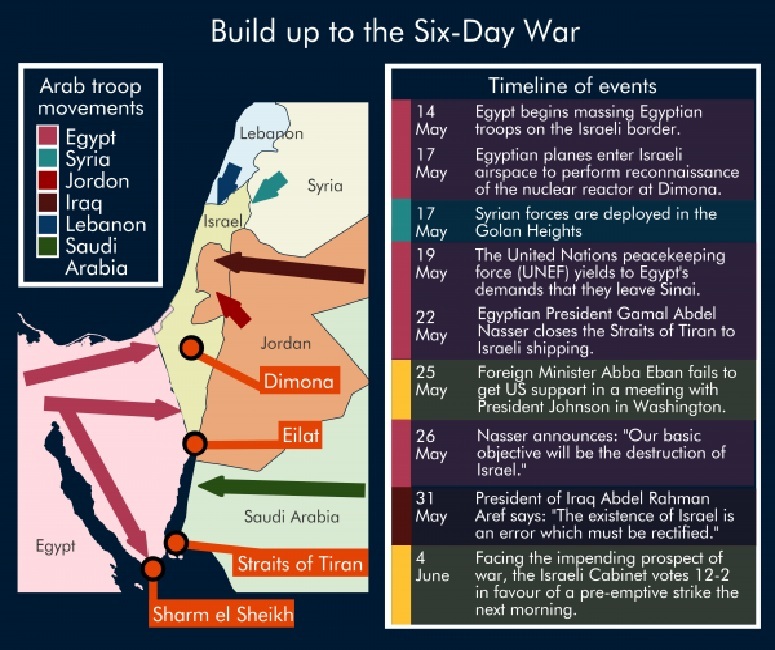 Below is the chart of the acts leading up to and including that fateful vote which started the Six-Day War. The next item which is often misrepresented is the actual belligerents. This is where things get a bit peculiar as there are three sets of belligerents. 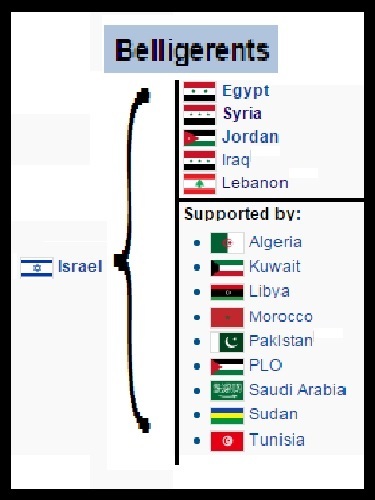 One belligerent involved in the fighting is obviously Israel and another set are the nations Israel fought directly on Israeli or Arab soil which includes Egypt, Syria, Jordan, Iraq and Lebanon. The often ignored set are those who provided some assistance without ever directly engaging troops in the actual ground fighting, and these include Algeria, Kuwait, Libya, Morocco, Pakistan, Saudi Arabia, Sudan, Tunisia and the Palestinian Liberation Organization (PLO) which is placed as only being a supporting force as it represents no nation and came under no actual command and actually only provided assistance by attempts at destroying the regions as they surrendered ground in the retreat without engaging the Israeli Defense Force (IDF). The chart is below. The biggest misinformation portrayed as one of the victims of the Six-Day War is the imaginary entity of Palestine. There was no nation called Palestine engaged in the Six-Day War. Truth be told, there has never been a nation called Palestine and that name only has referred to the area which was the Roman Province of Syria Palaestina, which was the Roman renaming of the province of Judea after the Bar Kokhba Revolt, the third Jewish uprising against Rome, in an attempt to name it after the Jews most preeminent of enemies, the Philistines. The Philistines migrated and after their final defeat in the Middle East against King Solomon, they relocated to their farthest colony, Carthage. The Carthaginians, renamed from Philistines by Roman historians, fought three wars with the Romans known to any decent history major as the Punic Wars of which there were three. After the Third Punic War the Romans sacked Carthage, salted the earth around Carthage and, just as they had done with the Jews after their third uprising, dispersed the remaining Carthaginians throughout the Roman Empire to the far fringes and some even sent beyond Rome’s borders in order to assure that they would never rise again. This dispersion was the death knell for the Carthaginians and removed any chance for a return of the Philistines as well. So, there were no Philistines or any nation of Philistine or Palestine or Falestine, as the Arabs pronounce Palestine. Palestine has only ever been a region which included what is today Syria, Jordan, Lebanon, Israel and possibly reaching into Iraq when the Romans named the area Syria Palaestina, and under Britain Palestine was simply what would become Jordan and Israel. This was what is known as the British Mandate of Palestine which is shown below with the resulting agreed upon division presumably backed by the League of Nations, the United Nations and the British Crown. That brings us to the big question, if there was no country named Palestine, then what in the name of all that is holy did the map look like. We have been told that Israel defeated Palestine and had attacked Palestine, not Egypt or Jordan; and, of course, Syria, as Israel stole the Golan Heights. First let’s simply decode what the map appeared as and why. The area which is today Hamastan, formerly Gaza, was part of Egypt who controlled it and allowed their citizens to use the area freely but never formally annexed the area, and Judea and Samaria had been annexed by Jordan who gave everybody within that area Jordanian citizenship and renamed the area the West Bank so it would not sound so “Jewish” and that was the story. 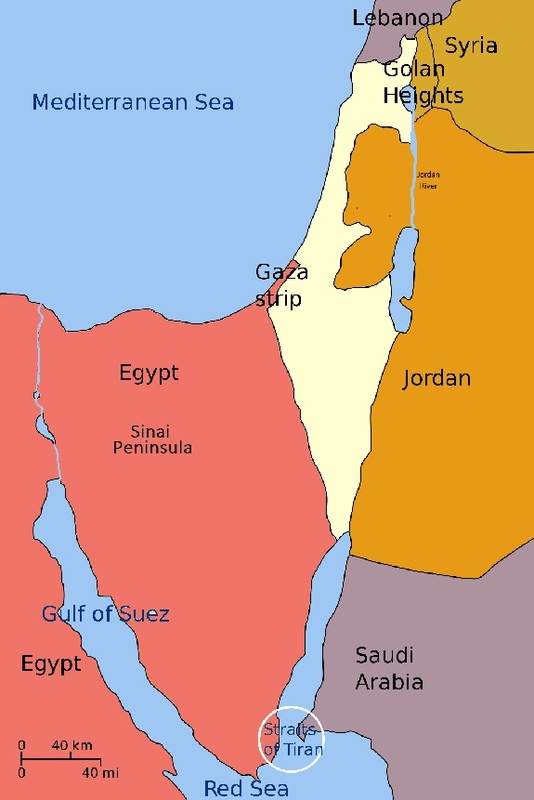 Egypt retained Gaza after the 1948 War to Annihilate the Jewish State, also known as the Israeli War of Independence so as not to refer honestly to who started it and what their intent had been. Jordan retained the areas of Judea and Samaria from the 1948 War to Annihilate the Jewish State. The Six Day War could just as easily be called the Second Attempt to Annihilate the Jewish State in 1967, but again we try not to run salt in the wounds of their failure. But they use these failures by naming them with the 1948 War to Annihilate the Jewish State referred to as the “Nakba” with the Second Attempt to Annihilate the Jewish State in 1967 referred to as the “Naksa” (“Day of Setback”), as they love to have original sounding names. Below is the actual map of June 4, 1967 on the eve of the Six Day War immediately before the morning in which the hostilities blew up. Now all we need are maps showing the build-up of the Arab forces and the attack routes taken by the IDF which allowed Israel to take back Gaza, Judea, Samaria and to also conquer the areas of the Golan Heights and the Sinai Peninsula. The battles for taking Jerusalem, Judea and Samaria fighting Jordan were basically initially dictated by the Jordanian assault the second day of the war after Israel pleaded for them not to engage and attempting to inform them that both Egypt and Syria were losing and that Lebanon had simply held their border and had not attacked but the Jordanian King believed the glowing reports coming out of Damascus and Cairo that they were advancing on Tel Aviv and the Jews had thrown down their weapons and run away. Jordan quickly found out that the Jews were not throwing down their weapons and were definitely not running away from a fight. When Jordan attacked, Israel diverted a division which was just setting out to relieve troops in the Sinai Peninsula and much like Patton when he relieved Bastogne, these troops simply made a left face and proceeded to make their new movement for engaging in a new direction. The Golan Heights were also a straight force on force fight with the Syrians initially holding the high ground. Their positions were camouflaged and presumably well hidden except for one small problem; the Israelis had an officer, Eliyahu Ben-Shaul Cohen (Hebrew: אֱלִיָּהוּ בֵּן שָׁאוּל כֹּהֵן‬‎, Arabic: إيلي كوهين‎‎) in the Syrian Army becoming the Chief Adviser to the Minister of Defense. Once, while visiting the positions of the Syrian military in the Golan Heights, Cohen feigned sympathy for the soldiers exposed to the sun suggesting that trees could be planted at every position to provide the soldiers with shade from the summer sun. Unbelievably, this is exactly what the Syrian military ordered and in the 1967, Six-Day War the Israelis targeted these very same trees making the conquest of the Golan Heights far less costly. Sometimes the truth is far more fantastic than anything one can invent. The results of the Six Day War are well known but a few items have been muddled into disinformation. The United Nations did not order Israel to return all of the lands gained but only to return land. They did not specify further other than to posit that Israel should have secure borders which were recognized and defensible. Most leaders, politicians, Ambassadors to the United Nations and even the United States State Department believed that this intended for Israel to retain a small distance on the Syrian side of the downslope beyond the ridgeline of the Golan Heights and all of Judea and Samaria making the Jordan River as the eastern border for Israel. Many believed that Israel would have been justified in retaining half of the Sinai Peninsula and using the mountainous central region as the new Israeli border with Egypt thus restraining any attack routes that would be available to Egypt if there were ever a future confrontation. Israel returned the Sinai and Egypt conceded all of Gaza which Israel then ceded to the Palestinian Authority in August of 2005, and who lost it in a bloodied coup to Hamas in June of 2007 which then forced Israel to engage in a blockade to prevent the arming of the Hamas terror regime with heavy weapons. That blockade has prevented much from entering Gaza but they still have received sufficient military technologies from Iran to now threaten almost all of Israel with their rockets and missiles with relatively accurate targeting ability and some very destructive payloads, sufficient to topple almost any skyscraper in Tel Aviv with a direct hit, as displayed in the following image below. Israel has annexed the Golan Heights and signed a ceasefire with Syria signed on May 31, 1974. Despite this, attacks have originated out of Syria launched either by Hezballah, the IRGC or the Iranian Quds Force. All three of these agencies work either under direct order of the Iranian regime and the Mullahs or indirectly in the case of Hezballah who can initiate attacks on their own volition should something present itself but largely they operate under the orders from Tehran. These attacks are sufficient to prove that Israel can never return or give away the Golan Heights and must retain their military presence on the ridgeline. This brings us to the final and most pressing difficulty Israel faces currently, and it has been internationalized just as Mahmoud Abbas intended. That is the problem of who will own what parts of the areas of Judea and Samaria which Mahmoud Abbas and Arab propaganda has defined as the nation of Palestine that Israel invaded and destroyed in the Six-Day War. The new narrative is that Israel invaded Palestine in June of 1967, and responding to that Egypt, Syria and the rest all came to the aid of Palestine and Israel then stole land from the rest of them in a stunning and unbelievable defeat, an impossibility as they were mighty and Israel is Jewish. This was the message they portrayed in their media with cartoons during the Six-Day War (see images below). 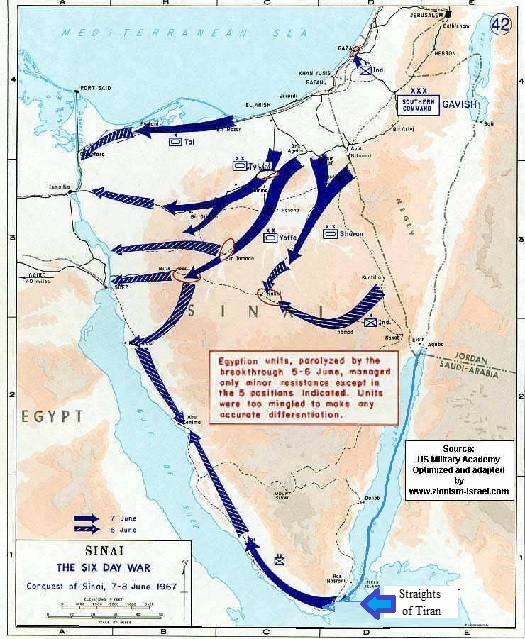 If you remember the map, we requested you check showing the map as it was the eve before the Six-Day War, there was nothing even called Palestine for Israel to attack. Check again if you are in doubt. Both that map and the one which depicted the massings of troops on the Israeli border show the countries as they were and the only nations bordering Israel were Egypt in the south, Lebanon in the north, Syria in the Golan Heights, Jordan along the east and Saudi Arabia at the southern most tip sharing the border with Jordan and Israel (perhaps a couple of millimeters). The concept of Palestine and a Palestinian People was cooked up in Moscow with the KGB working to find a means of inserting their operatives and KGB trained agents of Yasser Arafat and Mahmoud Abbas into the Middle East to destroy Israel and defeat the United States ally. It really is that simple. The KGB with its two little friends in tow met with the Arab League who allowed this with a fair amount of trepidation and many reservations. This was in the summer of 1964 and the Arab World still had visions of their great coming victory when they erased the embarrassment from 1948 when the impossible happened, the Jews won. After the Six-Day War of June 1967, and its sequel, the Yom Kippur War of October 1973, the concept of an Arab state named Palestine which Israel attacked and the Arabs responded in 1967 and again in 1973 in order to salvage and restore their Palestinian Arab state and using what was then thousands and now millions of refugees to inundate and destroy Israel became more and more appealing. The concept was as simple as it was brilliant. Before September 1964 when Palestine or Palestinian was used, it referred to Israel and the Jews respectively. The Arabs were called Arabs or Syrian or Egyptians and wherever else they originated. But as soon as the KGB propaganda machine got going, the entire history of the Middle East was reinterpreted. Now Palestine meant the Arab state which existed before Israel was imposed as a colony of the British to destroy the Arab nation of Palestine. Palestinian throughout history now meant Arabs. There was no problem that the Palestinian Brigades who fought with the British in the two World Wars was comprised of virtually all Jewish fighters or that the Palestinian Post became the Jerusalem Post, an Israeli Jewish paper, or that the Palestinian Symphony Orchestra became the Israeli Symphony Orchestra, or any of a million other references, all history was to be reinterpreted and the KGB Ministry of Information (Orwellian reference) rewrote all the history books, edited all the films, reframed all maps and presto-chango the Jews were written out of Middle Eastern history. Moses was now a Muslim, Kings David and Solomon were now Muslims (we suspect Goliath might have become a Jew), Samson was a Muslim (Delilah probably now a Jewess), Joshua, Daniel, Ezekiel and the rest of the prophets, judges and Kings were now all Muslims. Ancient Israel and Judea were renamed Palestine and who can guess how far they intended to go. The simple end result was that all of Israel was on land belonging to Palestine and the Palestinians and the Jews were now interlopers. This is what they are still selling and much of the world had bought into hook, line and sinker. The demand is a return to the pre-Six-Day War lines, the Green Line. We can show you the reason for this demand with a simple picture, the top is the day before returning to those lines and the bottom the morning after, the rest is self-explanatory. That should make it obvious, especially after the recent over one-hundred rockets fired from Gaza onto the relatively sparsely populated region of southern Israel and they still struck at least one home and a kindergarten. 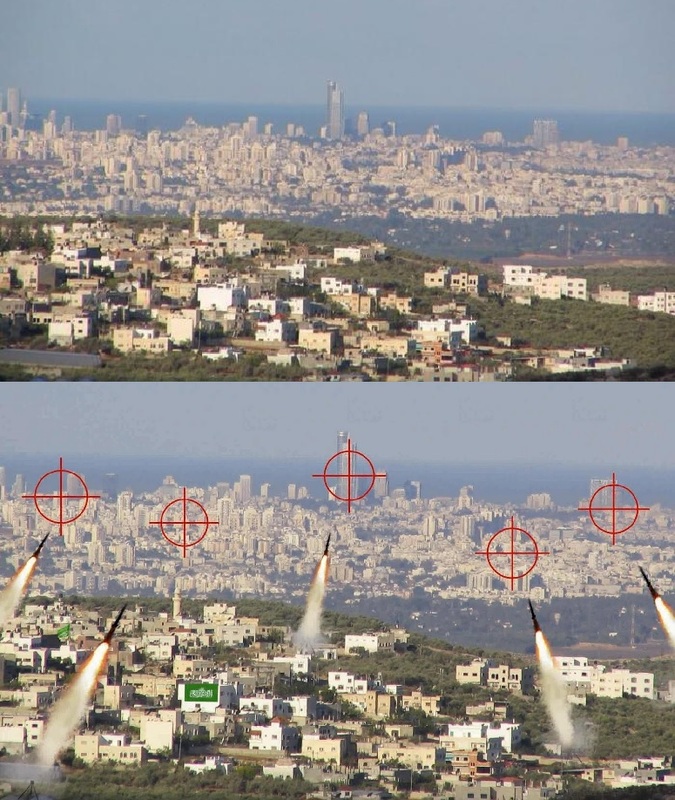 What they would strike shooting from the Judean Hills is frightening, even if you do not reside in Tel Aviv. They would have a relatively similar viewpoint for striking Haifa, Netanya, Petah Tikva, Hadera, Jaffa, Bene Barak, Ramat Gan, Lod, Rehovot, Ra’anana as well as Ben Gurion Airport and countless other communities in and around the Tel Aviv metro area. The one truth which makes almost any Zionist crazy is that the world promised that after Jordan, then called Transjordan, was cut from the British Mandate as a home for the Arab population using the Jordan River as the boundary and granting the Arab state seventy-eight percent of the Mandate lands, the world promised that would be the final division and that the Jewish State would be built in the remaining twenty-two percent, allow us to repeat, the remaining twenty-two percent, and the Jordan River would be the eastern border. This is all we honestly ask the world to do, keep their promise. Israel would probably be glad to offer any Arab desiring to leave and relocate elsewhere a monetary incentive to assist with relocating their lives on top of paying them a generous amount for their properties. Those steeped in terrorism and attempting to destroy the Jews, well, they had best just leave should the world ever make good on their words. Why Israel did not simply wipe Gaza clean after the latest rocket barrage is unknown. Any other nation in the world after suffering through the wars with Gaza, the terror tunnels from Gaza, the recent and continuing rioting from Gaza, their now allying with Iran to destroy Israel and murder every Jew on the planet whenever they explode out from Gaza and the incessant rocket threat from Gaza. Recheck the map about the rocket and missile threat from Hamas and Islamic Jihad in Gaza and then add that Hezballah has missiles which can strike Cairo and Saudi Arabia as well as all of Israel in numbers approaching or surpassing one-hundred-fifty-thousand, allow us to repeat that number, sitting just north of Israel in southern Lebanon and now eastern Lebanon in the Bekaa Valley and across the border in south western Syria Hezballah has one-hundred-fifty-thousand plus rockets and missiles. 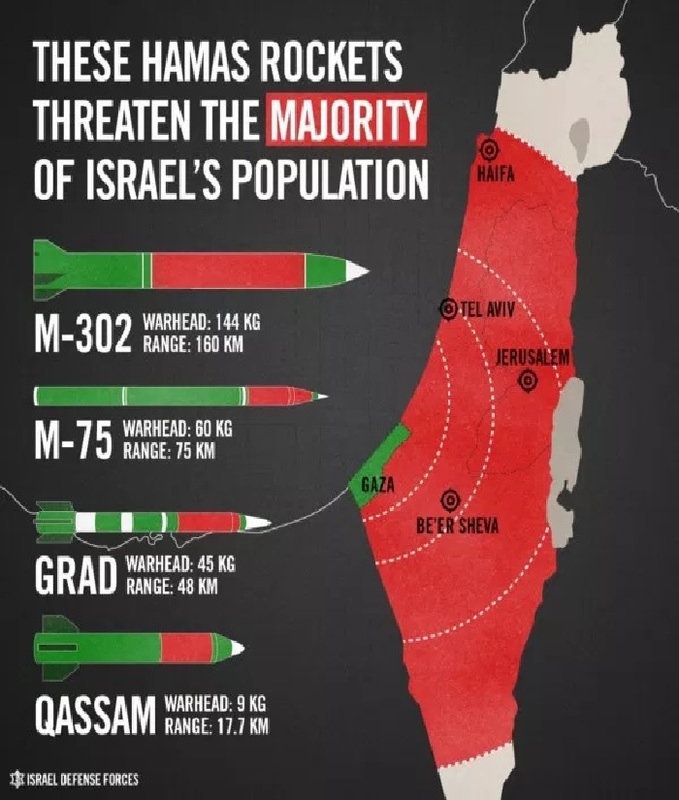 These are existential threats to the existence of Israel and why these threats have not been removed after the wars, terrorism, threats and everything with Iran is beyond reason. And the world blames Israel for living under such threats and claims that the threats against Israel are of no concern or consequence and why are we so worried; we should just give the Arabs what they demand and they will leave us alone. The world knows full well what they demand is us, all of us, dead, and the world is mostly fine with that. Think what your country would do if first you were as small as New Jersey (for the Americans), Albania (for Europeans), or twice the size of Yorkshire (for our friends in Britain), and second your neighboring areas were armed as are ours and desired everyone in your area dead, all eight and a half million of you, or at least the six and a half million who have a certain item in common, religion, hair color or any arbiter. We are willing to bet that should you posses the power, they would be gone at the first sign of belligerence. The world demands we be more sensitive and gentle with our potential murderers.